Teaching ESL, or English as a second language, can be a challenge regardless of whether you are teaching children or adults. Not only do the non-native speakers need to learn new vocabulary and a new set of words, but those taking ESL courses also need to learn the structure of English sentences and some basic grammatical rules. Fortunately, there are many websites online which help provide information so students can learn the basic fundamentals of ESL: new vocabulary. Once students have this new vocabulary underway, it becomes easier to move on to more advanced lessons. 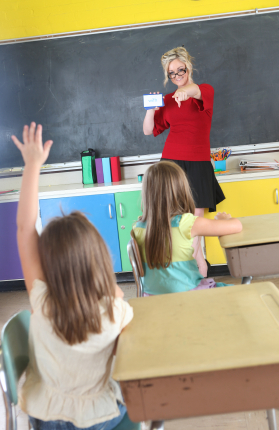 Flashcards are a great way to learn new vocabulary and to commit it to memory. However, making flashcards can be time consuming. Fortunately, there are a wide range of printable ESL flashcards available online that both students of ESL and teachers can print. ESL Flashcards -This site provides free access to nearly 3,000 flashcards. The cards can be printed directly from the site for free. Each set of cards comes in a pack and in different sizes making them ideal for playing games to teach language skills. Each card also contains a full color drawing of the action, adjective, or any other parts of speech you want your students to learn. These flashcards contain it all: body parts, animals, the alphabet, Christmas and other important holiday items, clothing, daily activities, food, and numbers just to name a few categories. ESL-Kids - This website is much like the other one in the sense that it provides a number of flashcards covering the many words one would need to learn to function in an English speaking country and learn English as a second language. However, on this site the pictures on the cards teach the same words, actions, and other things that the above flashcards do, while being more geared towards children. These flashcards are also completely free and available in sets. You can choose to download the sets by the types of words you would like your student(s) to learn. The cards can be downloaded with or without the correct words printed on them as well. This site also offers free printable activities for children to help them further enhance their English language learning. ESLjunction - This site provides flashcards for free and provides the cards in two different sizes. The site also has links to suggested games that can be played with these flashcards and provides tips on encouraging young learners learn English as a second language. Like the other sites, the free flashcards here are offered in different sets including: zoo animals, birds, organs of the body, classroom objects, and flowers to name just a few. Teach Children ESL - This site has free flashcards that it says can teach children, but that are also acceptable for teaching any student learning English as second language. These flashcards, unlike some of the ones before, actually show different items in different settings as a person would see them in real life. For instance, all the words associated with a dining room are pictured in a dining room setting in the flashcards category involving items in the house. The flashcards are available for download in PDF files from the site and the user can make the choice about how big they want the cards. One feature that this site that has many others do not, is that the flashcards also point out certain letter sounds in a set that are similar. These sounds are highlighted on each flashcard in the set to show their likeness in sound, which can help students with pronunciation skills. 1-Language - This is another site offering free ESL flashcards. The site offers flashcards that can be printed, but there is little variety and the flashcard library is not as comprehensive on this site as it is on some others. The "pack" contains 18 flashcards covering animals, children's things, foods, actions, and elements from the holiday of Halloween. "ESL Flashcards." YourDictionary, n.d. Web. 21 April 2019. <https://esl.yourdictionary.com/lesson-plans/esl-flashcards.html>. Teaching ESL, or English as a second language, can be a challenge regardless of whether you are teaching children or adults. Not only do the non-native speakers need to learn new vocabulary and a new set of words, but those taking ESL courses also need to learn the structure of English sentences and some basic grammatical rules.Fortunately, there are many websites online which help provide information so students can learn the basic fundamentals of ESL: new vocabulary. Once students have this new vocabulary underway, it becomes easier to move on to more advanced lessons.